Discover the highlights of the Golden Circle on this comprehensive private day tour. Take the stress out of driving on winding mountain roads by having round-trip transport in a 4WD provided. You’ll travel between dispersed sites with ease, and see many top sites in a day including Thingvellir National Park, Gullfoss Waterfall, Kerid crater, Faxi waterfall, and the Geysir geothermal area. We took a few tours during our stay in Reykjavik and this was our favorite! It was 4 of us and our private driver guide, a native Icelander, who added his personal experiences with the facts and explanations of what we were seeing. We were on our own schedule and got to choose our start time. We didn't have to wait for others on the tour to return to the 'bus' after each stop. We even made a couple of stops off the beaten path. I would recommend this tour as the best way to see the Golden Circle. This tour was amazing, our guide was very friendly and informative. Being with a private guide we could see the sights at our own pace. We were able to actually pet horses and stop at a working farm for fresh made ice cream. Our guide was able to avoid most of the bus crowds. 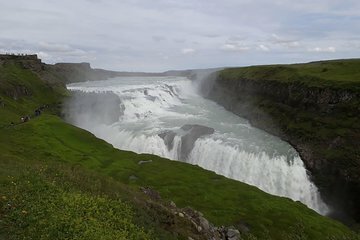 We originally planned on doing the Golden Circle but did that a day earlier so we could do the waterfalls instead. Our fantastic guide Bjarni Þorsteinsson took us on the most amazing tour where we visited Seljalandsfoss waterfall, Gljúfrabúi waterfall, Skógafoss waterfall, Sólheimajökull glacier lagoon, Urriðafoss waterfall, and managed to do the entire thing in just under 7 hours. He was incredibly knowledgeable, prompt and helped us see the most incredible day of waterfalls you could possibly see in your life. Just amazing!